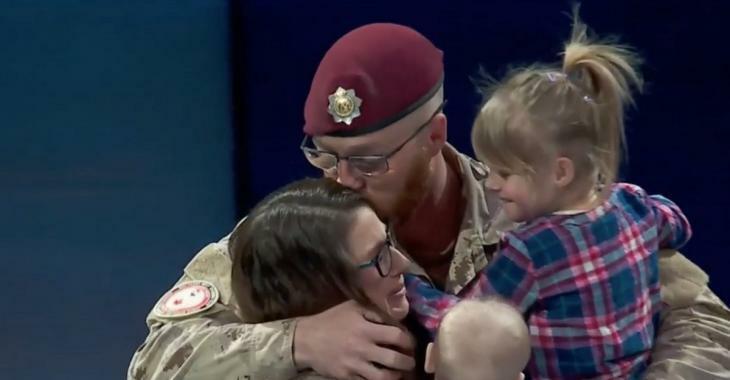 Videos : Penguins and Leafs help a Canadian soldier surprise his family. Penguins and Leafs help a Canadian soldier surprise his family. A Canadian solider has just helped create one of this year's most beautiful hockey moments thus far. On Saturday night the Toronto Maple Leafs held a wonderful event known as military appreciation night, a night in which they honor a member of the Canadian Armed Forces who are of course had at work keeping their Canadian citizens safe both at home and abroad. The man who was being honored on Saturday night was none other than Corporal Jeremy Hillson, and although Hillson could not be there himself his entire family had gathered around in his honor. Hillson appears to be a very lucky man indeed as waiting for his video to play on the red carpet was a gorgeous little girl, a beautiful little girl and his loving wife. They were all there for the ceremonial puck drop and, although the kids were probably far too young to care or even take notice, they were also joined by two of the National Hockey League's most recognizable players. The ceremonial puck drop was set to take place between Pittsburgh Penguins captain Sidney Crosby as well as a man many consider to be a dark horse to one day wear the "C" for the Maple Leafs, veteran defenseman Morgan Rielly. There was only one problem with this ceremonial puck drop however and that was the fact that it was missing one key ingredient, the puck. As the family looked around confused a soldier that was accompanying them did his best to play dumb and pretend as if he had forgotten the puck or had simply lost it, but it quickly became very clear that he was in on the stunt. The stunt of course was that Hillson was not merely on the big screen in the form of a video, but instead had come home from Iraq to be with his beautiful wife and their two beautiful children. It was an incredibly meaningful moment and although it is one that we have all seen at sporting events around the world, or even just on social media, you could tell it had a profound impact. Hillson's family was understandably emotional and you could even see a few people in the crowd quickly swiping tears from their eyes.